Major Connor MacKinnon despises his commander, Lord William Wentworth, beyond all other men. Ordered to rescue Wentworth’s niece after the Shawnee take her captive, he expects Lady Sarah Woodville to be every bit as contemptible as her uncle. Instead, he finds a brave and beautiful lass in desperate peril. But the only way to free Sarah is for Connor to defeat the Shawnee warrior who kidnapped her-and claim her himself. What’s not to love about a man speaking Gaelic? 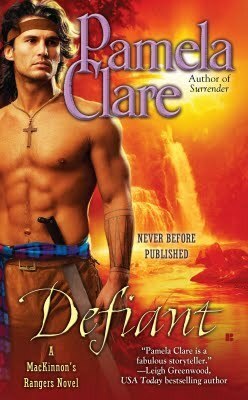 Defiant, my first venture into Pamela Clare’s writing, has definitely been an excellent experience. With a phenomenal plot and expertly-crafted writing, Ms. Clare draws her reader back to the days of pioneers, wars on the frontier, petticoats and gowns. While relaying the historical aspect of the time period, Ms. Clare doesn’t perseverate on the historical aspect; rather, she seamlessly blends her plot, peppered with historical facts to create a story that rings true. Connor, our hero, has been forced to lead a troop of soldiers in the name of the British. The first two installments of Ms. Clare’s MacKinnon’s Rangers series probably gave us much background as to how the family became indentured to the crown, agreeing to serve in the King’s Army. We catch a snippet in the introduction that gives us enough background to begin the story with a working knowledge of the world created. As I haven’t read either of the first two titles in the series, Surrender and Untamed, I didn’t feel as though I was missing out on any backstory. Defiant could be read in isolation, although after reading, I’m surely intrigued as to the stories of the other two brothers MacKinnon. As far as Connor goes, he struggles throughout the story with his inner conflict regarding actions from the past. This made him a truly believable character, and a hero worthy of respect. His prowess in battle, and his honor during interpersonal interactions endeared him to the reader. Mostly, his tenderness and commitment – they left me weak in the knees. Mmmmhmmm. I fell in love with Connor. The young and innocent Sarah, exiled from London due to circumstances beyond her control, served as an excellent damsel-in-distress, while maintaining her self-assured and brave facade. Sarah also battled her own inner-demons, reluctant to release herself from responsibility for the previously mentioned circumstances, Sarah’s initial self-esteem issues were rectified through the course of the novel. Coming from a loveless family, Sarah never showed her true self to those that were supposed to love her unconditionally. Her musical talents were chastised and hidden, causing Sarah to surreptitiously seek out opportunities to play. Sarah, however, came into her own. She fought battles to be with the man she loved, rather than be relegated to a loveless marriage with a treacherous man she couldn’t stand. Fortunately, we’re reading a historical romance and happily-ever-after is the name of the game! Though Sarah faced many trials and tribulations, she battled valiantly to be with Connor. Ultimately, she was true to herself, and that is all we can wish for those we love. Lord William Wentworth proved to be quite the villain in this story, as I surmised he was in prior installments of the series. While Lord William felt he was following the path of honor, he ultimately searched his heart and found the true path of honor in a final, selfless act, rooted in his love for Sarah. While we didn’t see much of Joseph, I feel that he was an integral part of the story. Without the aide of the Native Americans, the British would have failed miserably in the French-Indian War. Much as the Native Americans were important through the course of history, Joseph and his warriors impacted the direction of this tale in a positive, tender, and honest manner. While Joseph fought valiantly for Sarah’s freedom, I think that I find the best parts of the story involving him center on his brotherly connection with Sarah. As Ms. Clare states in her Afterward in this title, much of the story is historically accurate. The French – Indian War was a hard-fought battle that claimed the lives of many. Ms. Clare did an excellent job of re-creating life during that time period, bringing history alive for her reader.